See you at CicLAvia in NoHo! Are you ready, NoHo? 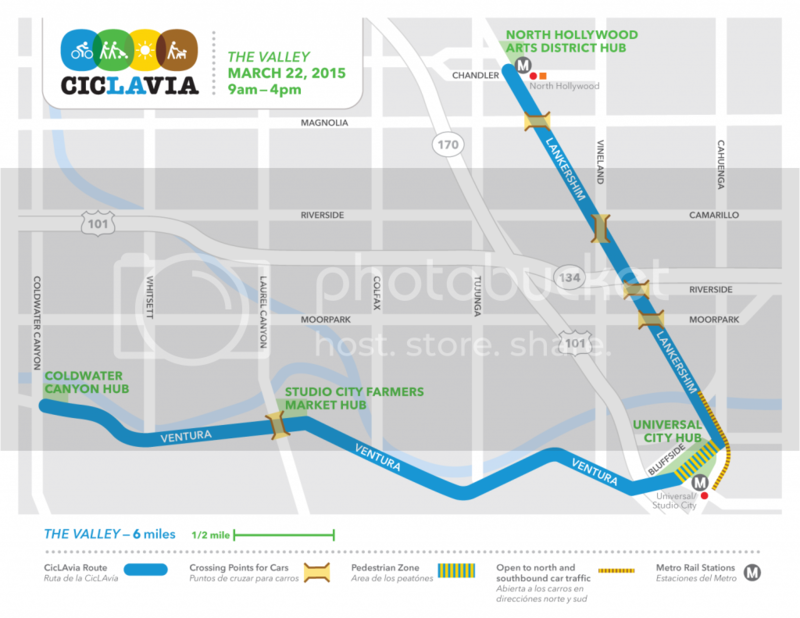 CicLAvia Valley is almost here! YES! The first 2015 CicLAvia of the year, presented by METRO, will be in the NoHo Arts District on March 22! That means there are no cars on the route so you can bike, walk, skate, and enjoy the neighborhoods between North Hollywood and Studio City. For the NoHo Arts District dot Com team, CicLAvia is a genuinely fun event where you get to know a neighborhood with a bunch of great people all happy to be outside and car free. So let’s get ready for this big day. Head over to the community meeting to find out about street closures, promotion opportunities, family activities, volunteering and to answer your questions. Let’s show L.A. some NoHo and Valley pride by being prepared for this huge event! YES! CicLAvia, presented by METRO, is coming to the San Fernando Valley on March 22. What’s even better is the first 2015 Ciclavia will be in the NoHo Arts District! You’ll be able to travel between North Hollywood and Studio City on car-free streets, using foot, pedal and non-motorized wheel power. Yes, that means there are no cars on the route so you can bike, walk, skate, and enjoy the neighborhoods. Combined, the NoHo Arts District dot Com team has been to seven Ciclavia events. So believe us when we say they are fun events where you get to know a neighborhood with a bunch of great people all happy to be outside and car free. So let’s show L.A. some NoHo and Valley pride on Sunday, March 22! Where: Metro Presents CicLAvia – The Valley will run along Lankershim Boulevard between the North Hollywood Metro Red Line stop at Chandler Boulevard and the Universal Studio Red Line stop, and along Ventura Boulevard between Campo de Cahuenga and Coldwater Canyon. The route will highlight some of the gems of the East Valley including the NoHo Arts District, Universal City, the historic Campo de Cahuenga, Studio City Farmers Market and the famed Sportsmen’s Lodge. 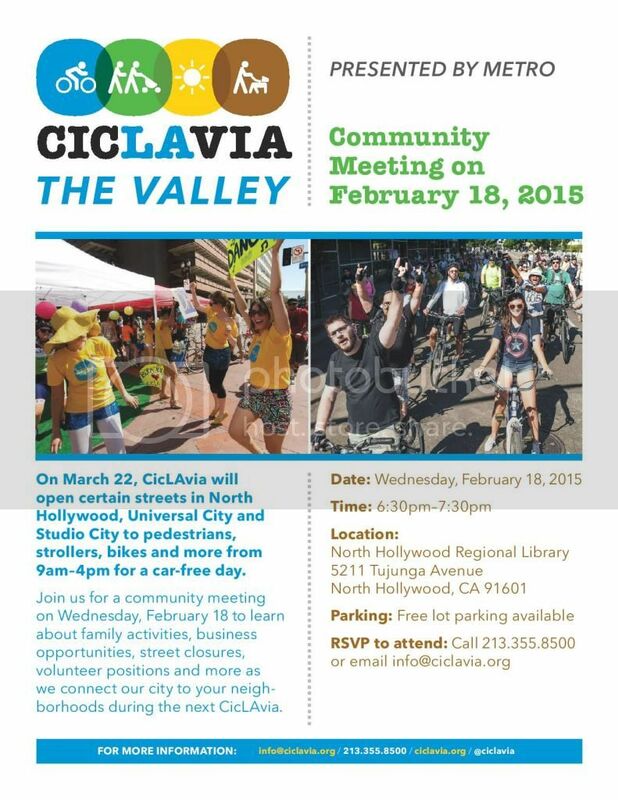 This CicLAvia - The Valley route travels almost exclusively through Council District 2, represented by Councilmember Krekorian, who was fundamental to making this San Fernando Valley event happen. “As someone born and raised in the Valley, and as Metro Chair, I'm especially proud that Metro is sponsoring the very first Valley CicLAvia to give Angelenos a chance to enjoy a new open space and explore our neighborhoods from a new perspective," said Los Angeles Mayor and Metro Board Chair Eric Garcetti. "This is a great opportunity for people to see how Metro can get them where they need to go without driving."